There’s been an open air, general and for a lot of the time unorganised and unregulated market in the area of Las Glories of Barcelona for centuries. Even though I’ve been to Barcelona many times over the last 20 plus years I’ve never made it to that place until this year (2015) – which might be a shame (in retrospect) but then shopping and markets ave never been my thing and my experiences of walking through the Madrid Rastro (never with any serious negative consequences (it’s a pickpockets and general thieves paradise) but coming away wondering why I had gone through the experience of jostling through thousands of people when there was never anything I might have wanted to buy). But I was glad that on my most recent visit to Barcelona I made it an effort to go to Els Enacants Vells, at Plaza de Las Glories. Not that I am any more interested in the market itself. There might have been a bit of twisted ‘romance’ about walking through a dust ridden, rubbish strewn, unorganised and chaotic location designed to extract the greatest amount of money for the smallest amount of value but I had missed that (no tears) and have to relate to the building itself. Which, I consider, to be a minor architectural marvel. By all accounts the remit of the tender was to provide a modern environment for an ancient market and I think that the architects (b720 Arquitectos, based in Barcelona but with offices in Madrid and also in San Paulo (Brazil)) have provided what was asked for in spades. What they have basically produced is a very interesting roof, supported by slender metal columns (new technology allowing for some innovative ideas to be brought to fruition) and underneath an environment that takes into consideration the original, in a field, in the mud when it rained, shabby and chaotic environment of a street market of yore. Now, I have no doubts that there were many people who didn’t like this change of venue – it moved across the Las Glories huge roundabout – or the introduction of regulations. There are, at the very bottom of the building, more or less in the basement, the same sort of stalls that would have been common in the ‘traditional’ market, i.e. all the bits and pieces up for sale on the ground, getting dirty and losing value every time they came out of the box. But they are in the minority. The overwhelming majority of the stalls are of a semi-permanent type and some are no different from the shops you might encounter on any (dying) local town. And that’s a problem, especially when you consider the genesis of the idea of a flea market. That was a market where anybody could go and sell what little they had. Now there’s a problem with that sort of heritage. Many people went to these types of markets in the past to sell what they had to eat or pay the rent. It’s a mark of disgrace on our western societies that that situation is still with us in the 21st century. It also meant that those not too honest people, the thieves and robbers of old, could dispose of their ill-gotten gains quickly, providing the unscrupulous poor of a way of acquiring those goods that had been stolen from their even more unfortunate peers. The new ‘old market’ is now a place for the up and coming petite bourgeoisie. The poor have been even more marginalised in selling their chattels and the profit goes to the middle-man. Rents here will be, undoubtedly, much higher than before and would have excluded all but the more prosperous thereby making a mockery of the idea of continuing the tradition of a ‘flea market’. Does that make the new building ‘classless’? Probably not. There’s a mix of small, pod-like shelters which can be locked up a night, next to which are basically shops, some big some not so big, but at least permanent. It’s only on the lowest floor where there is space for ‘arrive on the day with all the goods you want to sell’ space. If the poor are waiting for the state and other official capitalist institutions to bring them out of their poverty they will wait forever, and we’ll see no cultural advance, proletarian or bourgeois. It’s a light-weight, yet must be very strong, metal roof structure supported by relatively thin, yet also strong, pillars which provide shelter for the stalls beneath but still allows for the impression of it being an open market, their being no walls. This roof I consider to be an amazing structure. It’s made of reflective metal but it’s also fractured and in that way, each time you look up, and move even a short distance in any direction, the reflection is different. The roof is not complete in that there are areas where the sky is visible but they must be overlapping otherwise even ‘cheap seats’ in the basement would get the rain on occasions, which would create a certain amount of animosity. How that metal doesn’t tarnish and therefore mitigate the reflection is (at present) a mystery to me. 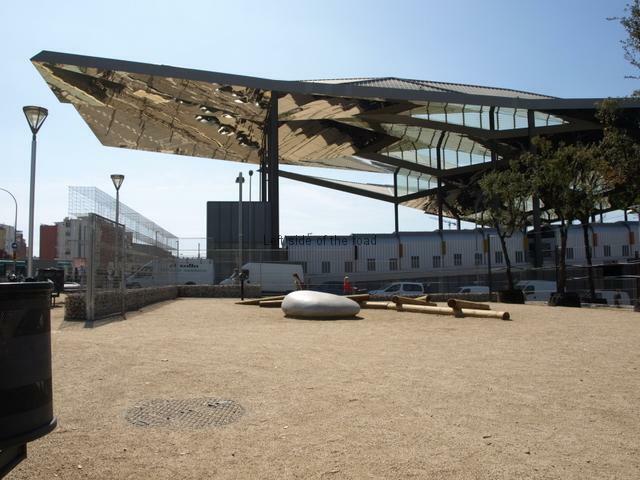 Barcelona is on the coast and Les Glòries is not that far from the Mediterranean and I would have thought that the salt in the atmosphere would have had an effect, but 18 months after opening the reflective capabilities of the roof seem unaffected. The structure was officially opened for business on Wednesday 25th September 2013 and it cost €52,659,814, which seems a lot for a roof and a few pavements, but it’s nice work if you can get it – and as it’s the public who are paying then, obviously, money is no object. We all know that land speculators, banks, and even environmentally friendly architects are suffering in the present climate of austerity. The roof is the most interesting aspect of the structure but the way the different floors seem to merge into one another is also unique, almost creating one of these optical illusions where you are on an endless road. You can get an idea of this from the maqueta. It is the result of the work of a group of architects known as ‘b720 Arquitectos’, headed by Fermín Vázquez. (The number 720 comes from the way in which architectural materials are codified – I know, I’m not really that much the wiser either.) This promotes itself as being, more or less, a collective where all ideas are considered equal but as the practice has been involved in a number of really big, multi-million Euro/Dollar projects, in Barcelona and other parts of Spain as well as Brazil, I would have my doubts about that. The practice has an ecological principle and seeks to design buildings which are in harmony with their surroundings as well as sing locally sourced materials. 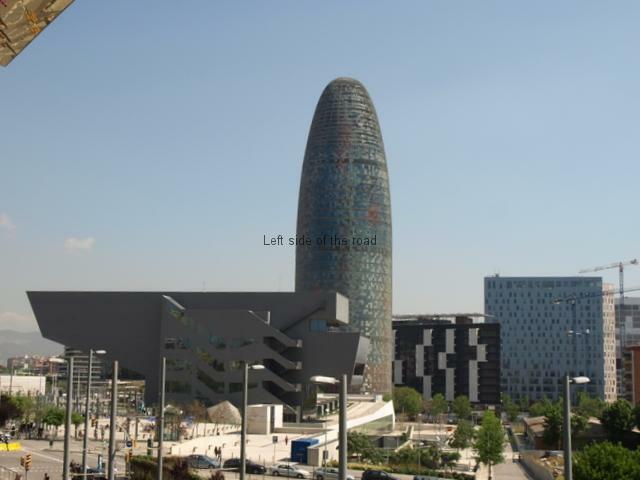 Among the other projects they have completed in Barcelona are the Torre Agbar (Barcelona’s smaller version of what is known as ‘The Gherkin’ in London – which I’ve never seen in reality), the Hotel Santos Porta Fira in L´Hospitalet de Llobregat (a seemingly top-heavy structure which is situated mid-way between Barcelona’s airport and the city itself) and an office building at Avinguda Diagonal 197. Les Glòries is a stop on the Barcelona Metro, on L1, Les Glòries, Encants station on L2 is not that far away. You can also get there by Tram on line T5.